As a threshold matter, you should be prepared to discuss VDE regarding something that is not found in HHS' audit protocol; that is, VDE pursuant to the methodology your organization has put in place to ensure coverage of all compliance requirements and, moreover, the methodology that will help a Requestor understand your organization is serious about pursuing a culture of compliance. In other words, the VDE that you show a Requestor should all fall within a compliance framework that is underpinned by your methodology. 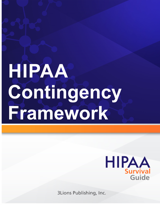 Showing VDE pursuant to your methodology helps frame the discussion in a manner that creates the desired perception of your organization commitment to your HIPAA compliance initiative ("HCI"). The principal takeaway from our discussion thus far is that you are not simply "throwing documents" at a Requestor, but rather those documents you provide should demonstrate VDE and fit within a well thought out approach that governs your organization's thinking pursuant to the entirety of your HCI. We can assure you, with a high degree of confidence, that initiating the conversation with the Requestor in this manner, not only sets the proper context, but more importantly goes a long ways toward influencing the Requestor's perception that your organization is one-hundred percent (100 %) committed to your HCI, or any compliance initiative for that matter. For the purposes of this article, we will take a more business like approach as to what you should be prepared to show a Requestor as compared to the voluminous (and at times indecipherable) requirements contained within HHS' Audit Protocol Revision 2 (circa April 2016; click here to download the protocol as a PDF). We will break down the documents according the the individual Rules: (1) Privacy Rule; (2) Security Rule; and (3) Breach Notification Rule. For the purposes of the article we are "tree topping" the kind of VDE required for each Rule. The intent is that you should be able to quick review the documents and categories proffered in the article and determine if your organization is indeed meeting these requirements. It should provide you a quick reality check as to where your HCI current stands. A methodology for determining when the Privacy Rule has been violated. The ability to process Authorizations according to the Omnibus Rule. Omnibus Rule compliant Notice of Privacy Practices. Omnibus Rule compliant Restriction Requests. The ability to process requests for access to PHI. The ability to process requests for amendments to PHI. The ability to process requests for an accounting for disclosures of PHI. Demonstration of a named Privacy Officer with his/her personnel file updated. Policies and procedures at the granularity level of a requirement. The ability to track process results at the granularity level of a requirement. A training program for your entire workforce. A specialized training program for certain individuals within your workforce. A methodology for determining when the Security Rule has been violated. Risk Assessments report for one more risk assessments. Demonstration that you have implemented an evergreen Risk Mitigation framework (See NIST SP 80-37 R.1). Ability to track system activity logs. A named Security Officer with his/her personnel file updated. Security Awareness Training across the organization. Contingency plans for: (a) disaster recovery; (b) emergency mode operations; and (c) Application Criticality. Technical controls to support all of the above. Physical plant and equipment controls. A methodology for determining when Breach Notification is triggered. Model letters to notify patients. Model letters to notify major media when required. Model letters to notify the Secretary of HHS. The ability to document Security Incidents. Timeliness of reporting for CEs. Timeliness of report of BAs.